Questions to Gerald Binks courtesy of the UK Budgerigar Forum website, www.exhibitionbudgerigarforum.co.uk, organised by Mick Freakley. Q1: What is the secret to maintaining a quality stud of budgerigars year after year? Unstinting good management and buying in outcrosses frequently, otherwise you produce small birds if a stud becomes too closely related. Sell 10 birds and buy one. Don’t put the sale money in your pocket or else the new buy becomes expensive instead of a swapping process. Q2: What is your opinion on the modern budgerigar compared to all the different types you have seen throughout your career? Please refer to both the aesthetic part and the physiological part (size, breeding difficulties, vitality, and fertility). The birds of yesterday were better than the birds we have today. Not true at all. I have seen all the changes in progress in my 66 years at this hobby and the beauty of the top birds we have today far exceeds all predecessors. The size of birds now is fantastic (look at the Best in Show Grey green of Les Martin’s at the 2010 Budgerigar Society Show, as well as his skyblue). New standards are being set all the time – and now in the chase for width of face, we have what I termed “the Buffalo effect”, which has gone worldwide. This faces us with an even greater challenge. Vitality and fertility, contrary to what many breeders think, with such big birds being infertile or difficult, is broadly incorrect. It is a poor diet that causes such results and basically bad husbandry. Yes, there are exceptions of course with individuals, but overall what I have said is correct. Q3: Can you predict where the modern budgerigar will be in five years time? Have you looked beyond the “Buffalo” effect? I am worried about the fact that I have seen birds that are already ugly with super heads, but dreadful carriage both of which are related to producing length of feather. The word “Type” seems rarely to be heard, or even practised. It is no use having “Buffalos” that exhibit drooping flights hanging below the body midline which exhibit narrow primaries and in some cases cannot fly. 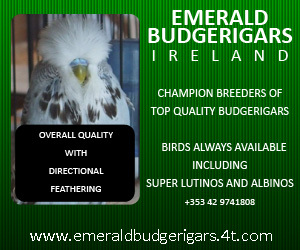 I have seen it in several aviaries in the past few years, in the hunt breeders have for super head quality. Without naming anyone, I know now where the long-flighted and long tails have come from – and it is not from the UK but outside the UK. As Jo Mannes says, a budgerigar has to be a “charming budgerigar” – not a bag of long feathers and ugly faces. Q4: September and March are the times when budgies are said to be in the peak of their breeding cycle. How do you build your birds up to get the best out of them? I do not, as such, as my feeding technique results, after my early mistakes and inexperience, are now near perfect. Thus the birds come into condition naturally in September and March as the question states. Why is this you ask? The reason is that there is still good natural light and this determines the condition factor. Artificial light is only on part of the day, so natural light is a massive factor. This is born out by the chart in Dr Robert Marshall’s book “The Budgerigar” (it took 12 years to write) where he compares the northern and southern hemispheres as regards which are the perfect times to start breeding. In both cases, he is dead right. In the UK we drag our heels with decisions made by well meaning fanciers who stick to a ring date without thinking deeply. A 1st January ring issue date is fatal, as breeders work to that date and pair up for the rings for the early chicks. Europe is far more advanced with a 1st November issue date so that pairing can be in September or early October – when there is still good light about!. The great difficulty in budgerigar breeding is starting them. Think about March as a month. For all my years, breeders have said it is better to start in March. It is of course the increase in light that makes it easier. In my opinion the ring issue date and BS Show date, now being forecast to change back to November, should be re-visited fast, but then our BS gets itself strangled by the fact that rules can only be changed every three years! Why do essential changes (that in business would be done immediately) take so long? Bizarre. I am being constructive based on facts – nothing more – and if change is effected more rings will be sold as a result of more birds requiring rings! Q5: What are your views on using birds with feather defects – in particular “tail less wonders” – or birds that do not keep a full complement of flight feathers? Do you feel this problem is genetic and by using birds like this could cause the problem to come out in larger numbers further down the line? “Tail less wonders” we obviously do not like – as it is associated with long feathers and the longest feather is the one feather that requires perfect nutrition in the aviary to grow to its full length. Otherwise the tails succumb to borderline FM – which is what it is! Such a bird will breed well and it will have no bearing on the chicks it produces – unless of course you haven’t paid attention to improving the diet and your husbandry. It’s not genetic! It’s your fault! Q6: Can you tell us a little of your selection process when looking for birds to retain for the following breeding season? I should have three flights and I only have two. You need three for sorting. One for the adult keeps, one for young keeps and one for sales. It is a big handicap here at “Tanglewood”, but I am too advanced in years to build another extension. To answer the question is difficult for these reasons. I just have to use my eyes and decide what to keep along with plenty of quality reserves as backup. Q7: You have been breeding exhibition Budgerigars for a very long time. If you were to start all over again, knowing what you do now, how would you go about it? Do nothing for a year. In that time go round 50 aviaries in the UK and Europe and learn everything, without buying a thing. The one asset you need is DRIVE. Without it you will not get to the top. Q8: Is there a particular fault in a bird that you just wouldn’t be prepared to work with? Long-flighted characteristics that can ruin a stud, which if present cannot be “worked out” by pairing to short feathered birds, back in, at a later date. It is a terrible dominant genetic fault. Q9: Do you have a number of different family lines? If so how many – and is there one more prolific than the others? Do you use lines as outcrosses, or do you go for outcrosses externally? There are three main lines here in the greens, grey greens and the blue series with, now, cinnamon being an important factor but used carefully. My records are near perfect as anyone who has been here will tell you. All lines are prolific with the odd exception here and there that we all get. The longer I have been in the hobby the more I realise that quality outcrosses are a must. The problem is where to get them and it is only the bigger breeders that have the numbers from which to be able to let you have what you want. Existing lines are not used as outcrosses. Some really informative and useful answers to these questions. Could I ask, please, that you add a picture of a long-flighted bird, so readers can see exactly what you mean. I understand that the long-flighted birds arrived in the UK in the 1980’s and were quickly banned / discouraged from the show bench here. It’s free – all you need to do is register and you can read interviews with: Ghalib Al-Nasser, Geoff Capes, Geoff Bowley and many more. I will write an explanatory article at a future date based around your query – but current photos are unavailable. 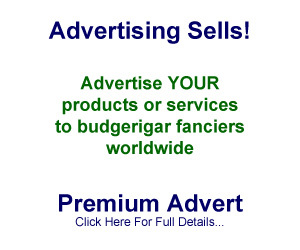 Wonderful advices on breeding thank you Gerald and The Exhibition Budgerigar Forum ( UK ) well done Mick Freakley. Habib Ur Rehman – Pakistan.